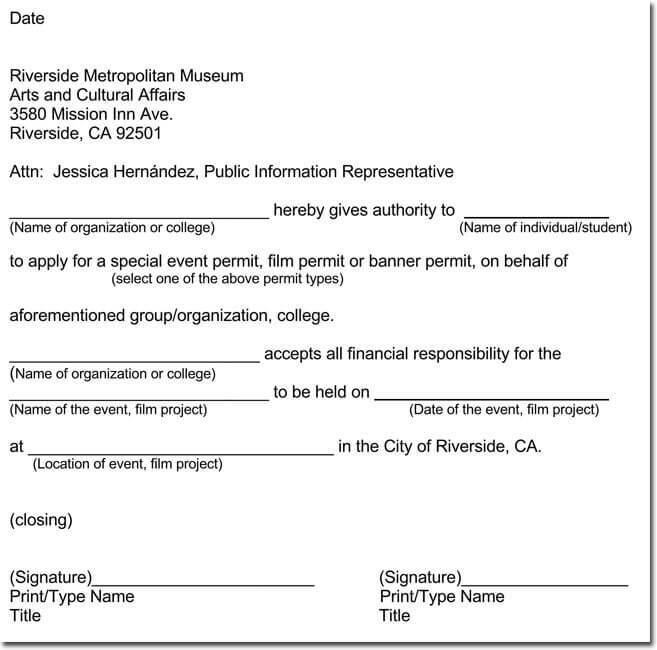 A permission letter template provides you with a clear understanding of how to write different types of permission letters. 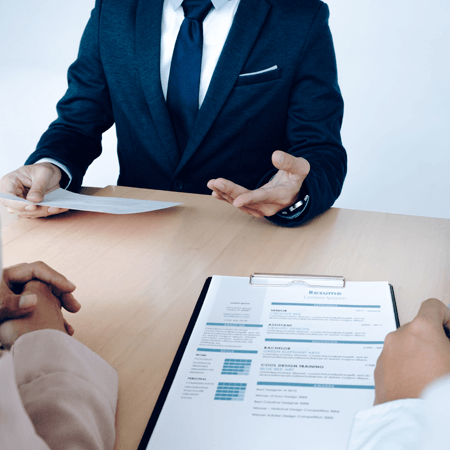 An approval letter grants a special legal authorization to the recipient. You can write to get approval for some event or other intent. For instance, when you want to travel, use copyrights, parents field trip permission or even a medical leave, you may require writing a request letter, it provides an understanding between you and the person it may concern. Authorization letter allows you to express yourself on why you need the consent and to show your respect for the receiver. Traveling is something that happens quite often, but there are rules and regulations. Countries and cities have set their procedures, and this is why you need a letter of permission to travel. Authorization letters are used to notify or request leave. The main importance of this type of letter is to acknowledge and give an individual the consent to travel. Another reason is if you are traveling with an underage child you must obtain permission from relevant authorities. Copyright permission letters are required when you want to use a photograph, video clip or a citation on someone’s work. Some situations may require you to obtain a copyright consent from the owner. These will help you to avoid plagiarism and also appreciate other people’s work. There are no specific words to use in your copyright letter; however, you must include your address, name, payment, where and how you will use the content in the request letter. The medical permission letter is a legal document that authorizes treatment of a child, senior citizen or any other person mentioned in the letter. In some cases, the authorities give the letter to the nanny, caregiver or babysitter. 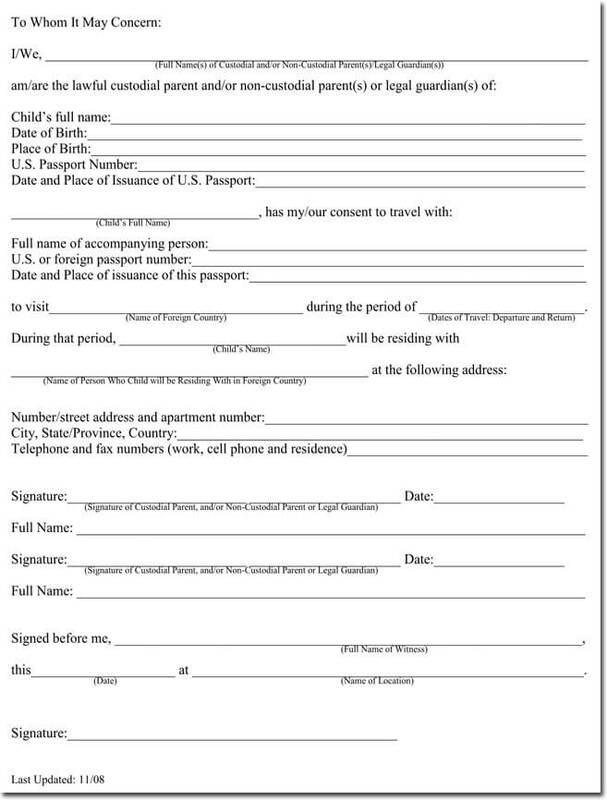 Another occasion that requires a medical permission letter is when your child is traveling with friends or on a school trip. It guides and allows the teacher or family member to make the medical decision for the child in the absence of the legal guardian. 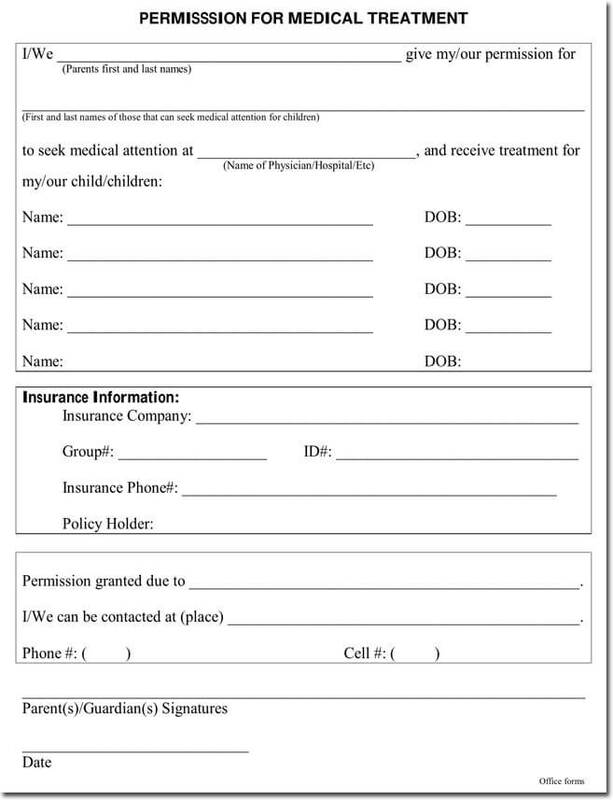 You can also use a medical letter when you or your child needs a leave to undergo medical treatment. 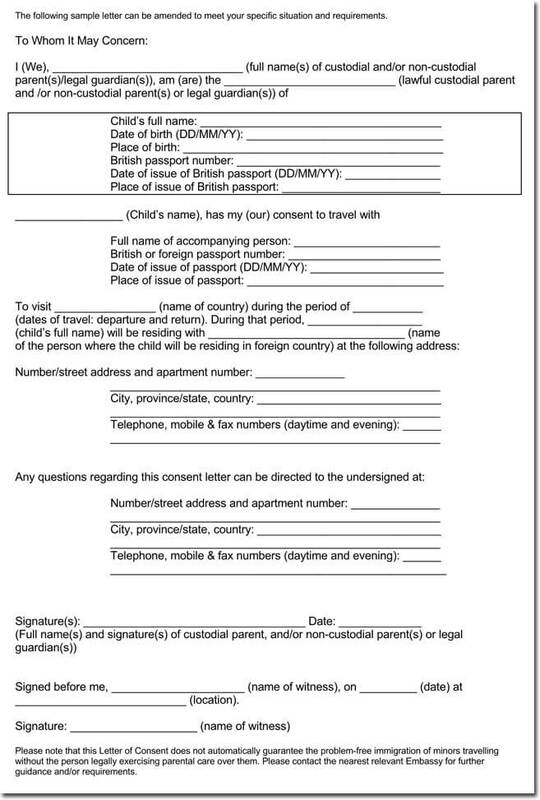 A Guardian permission letter serves in the event where the parent is away. It’s normal for parents to give guardianship of their underage children to other people especially when traveling on vacation, when going on business trips or when a child needs to stay with a relative for a while. The importance of these letters is to ensure the safety of children in the absence of their parents. Permission letter for an occasion is written to get consent from the person mentioned in the letter. It may be your boss, landlord or an authority figure. 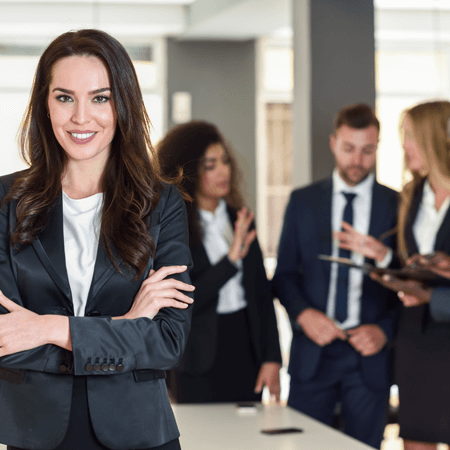 For instance, when you organize an event for the society or when you want to be the host of an office party you will need to write a request letter for authorization. Your letter should have an address, date and contact information. There are many different types of permission letters and various methods of writing. 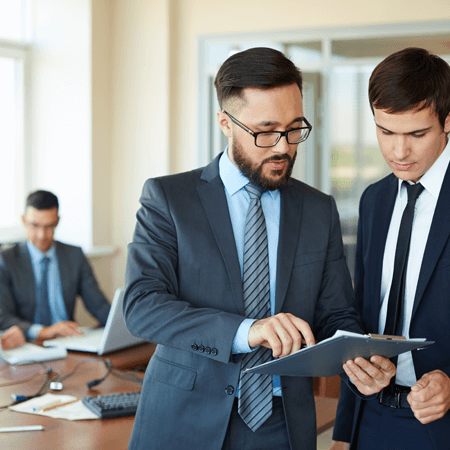 when writing these letters you should choose a format, start with a subject line, address the letter, state your purpose, specify the exact scope of consent, and provide your contact information. Your tone should be respectful, calm and to the point. 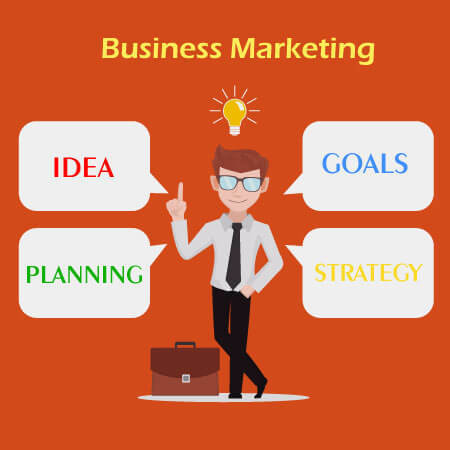 Provide the required details and information, and focus on the main ideas. Avoid unnecessary repetition of words and be specific. A proper permission letter is simple and organized. 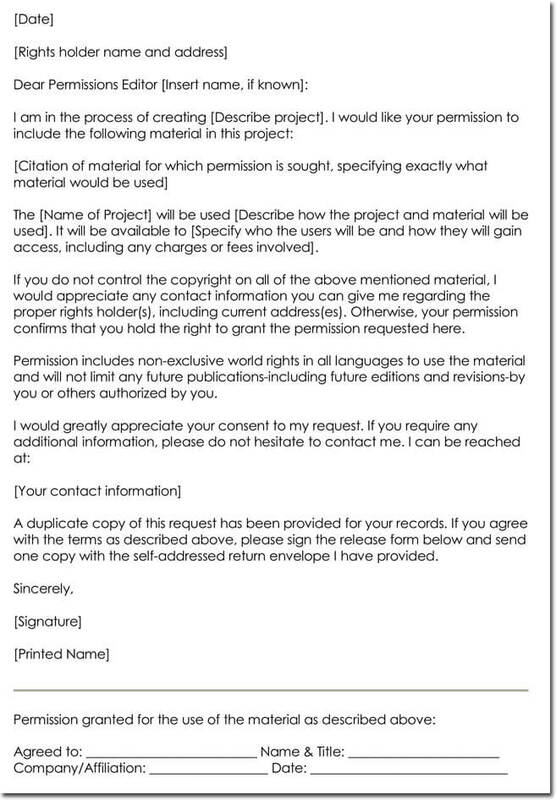 Our permission letter templates provide definitive guide and tips necessary for writing award winning consent letters. They are professionally designed and come with all details necessary for effective permission letter writing. We provide quality samples that help in creating a perfect approval letter. Get proper guidance when in need of a quality permission letter from our website. Just like any other piece of writing, a permission letter must observe all grammatical rules. The note takes the form of a formal letter and therefore must obey the necessary letter writing format and rules. Using a sample template made by professionals makes your work easier. This reason explains why our letter templates come in handy. We provide an easy-to-follow method in addition to templates that are tailor-made for your permission letter writing needs.